As one of the longest established Chiropractors in Amesbury, we pride ourselves in providing honest answers to your questions and clear solutions to your health concerns. On your first visit to our Amesbury chiropractic office we will take a thorough case history and determine if yours is a Chiropractic case. If it is then we will perform an exam and very likely take some x-rays to see your spine. First you will fill out some short paperwork and then, you will consult with Dr. Fowler regarding your condition. If yours is a Chiropractic case, a thorough examination will be performed and x-rays may be taken. You may then have a short therapy session. You should plan to spend 45 minutes to 1 hour on your first visit. Please wear comfortable clothing as you will receive treatment and any therapies we deem necessary. 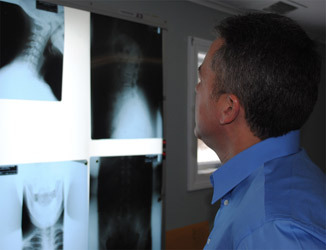 Dr. Fowler studying patient x-rays. Actually, a typical office visit may require just 10 -15 minutes. 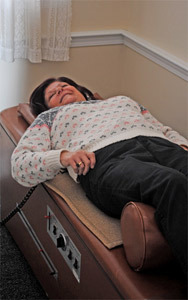 You’ll receive an adjustment and any therapy you need. During a typical office visit you will check in and proceed to the therapy suite (if applicable) and then to the doctors waiting room. You will be seen promptly. We pride ourselves on being on time!